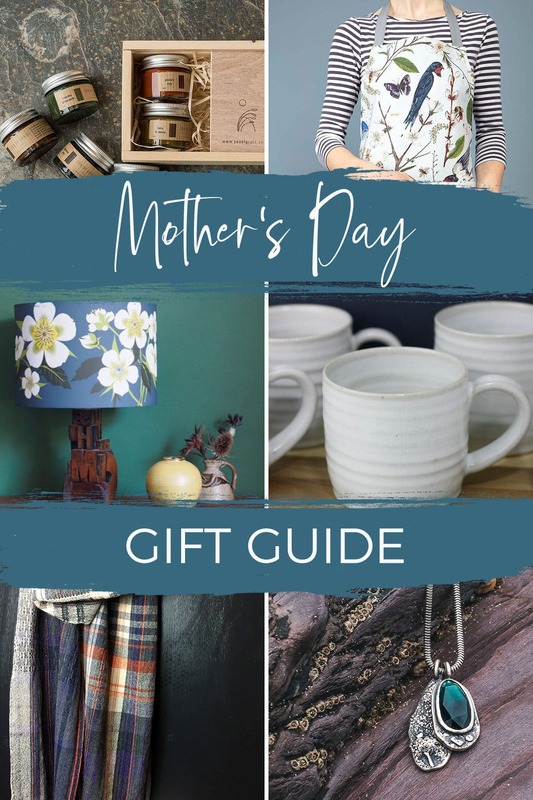 Following on from my first part of the Mother’s Day gift guide, where I showed you some beautiful personalised jewellery of my own, today I wanted to show you a few of my fellow Cornish creative’s gorgeous products. Some are even made right here in Boscastle! Donna of Sea of Grass Studio, based here in Boscastle, handmakes natural pigment watercolour paints, free from fillers, binders or driers. Perfect for the environmentally conscious painter and a contribution towards a simpler, more sustainable, slower way of living. You can also find handmade natural beeswax crayons, perfect for little fingers. In addition, Donna paints beautiful original artworks, contact her to find out more. 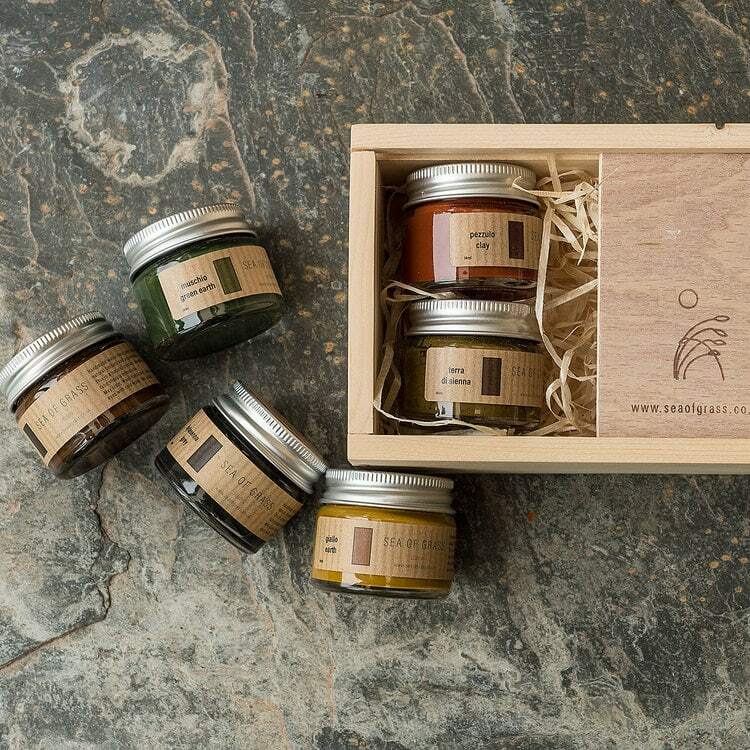 Pictured here is Donna’s 6 watercolour paints in handmade wooden box gift set. This set comes in two colourways; earthy and bright, and you can also buy the paints individually. Perfect gifts! Scottish born Fiona of Cornish based company Particle Press creates amazing patterns from her own original, beautiful paintings (check out her Instagram feed for inspiring paintings!). Her work is inspired by the large array of birds in Cornwall, wild flowers from overgrown hedgerows and meadows, birds, insects, nests and small creatures, and it’s all absolutely gorgeous! Fiona designs and makes fabric for homewares such as lamp shades and cushions, and you can also buy her fabrics by the metre. Her beautiful prints also adorn tea towels, aprons and stationery. I particularly love her gorgeous aprons, they would certainly make cooking tea a pleasure! There is also a gift box option with an apron, a tea towel and recipe cards, great for a Mother’s Day gift. Shown here is the Barn Swallow apron. 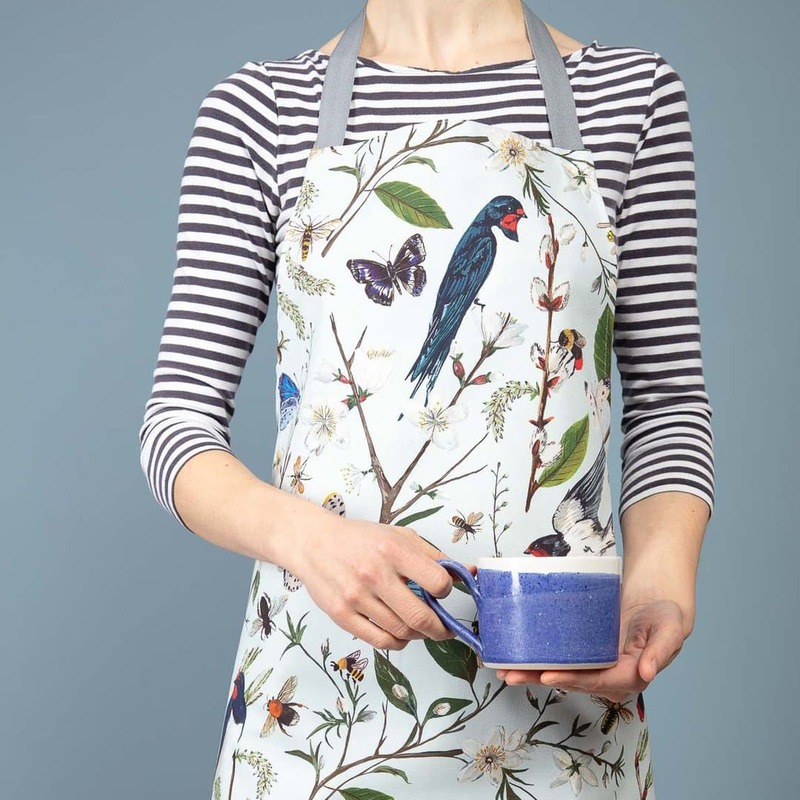 Acrobatic barn swallows amongst insects and butterflies are featured on this beautifully patterned apron that is sure to put a smile on mum’s face! Alison of Alison Bick Designs is a designer/illustrator who, inspired by the natural world and family events, creates unique illustrations with a mid-century modern feel. Starting with sketches and photographs she produces vector images which are adapted and applied to a wide range of mediums to create every day products such as lampshades and cushions, screen prints, silk scarves, greetings cards and gifts. Alison also offers brand identity and other design services, as well as bespoke design commissions. Alison’s designs are bold and colourful, with lots of character and personality, often with botanical motifs. She has also designed a range of vintage surf illustrations, inspired by her family’s history of surfing in Perranporth in Cornwall, which you can buy on prints and cards etc. She is an avid fan of bellyboarding and wild swimming and this is apparent in her product range too. This year Alison is working on a new collection of botanical designs, I can’t wait to see what she comes up with! You may have seen Alison on a bus! Yes, seriously! She was Outset Cornwall’s poster girl and inspiration for new (and “old”!) business owners all over Cornwall and had her picture plastered on buses travelling around Cornwall. She is also a founder of Etsy Makers Cornwall, and she organises events and fairs for creatives. Check out her web site for her full range of services. 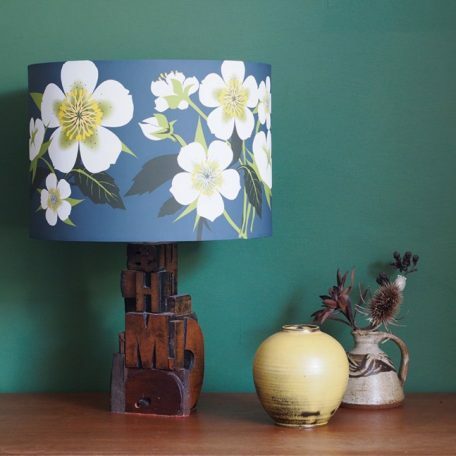 Pictured here is the Hellebore flower lampshade, a gorgeous addition to any modern or indeed mid century vintage interior. For anyone who appreciates a nice cuppa in a gorgeous handmade mug! I have known Natalie of Natalie Bonney Ceramics for quite some time, we first met while exhibiting at local fairs down here in Cornwall many years ago. I have always loved her simple, functional and beautiful ceramics. I think the Swede in me identifies with the simplicity and function there, and it’s right up my alley! Natalie makes a variety of functional pottery for everyday use, which is another reason I really like her work. I think beautiful items are made to use, to enjoy on an everyday basis. She makes mugs and cups, salt pigs (check them out! ), garlic dishes (I have one of these, brilliant! ), jugs, bowls, planters and more. 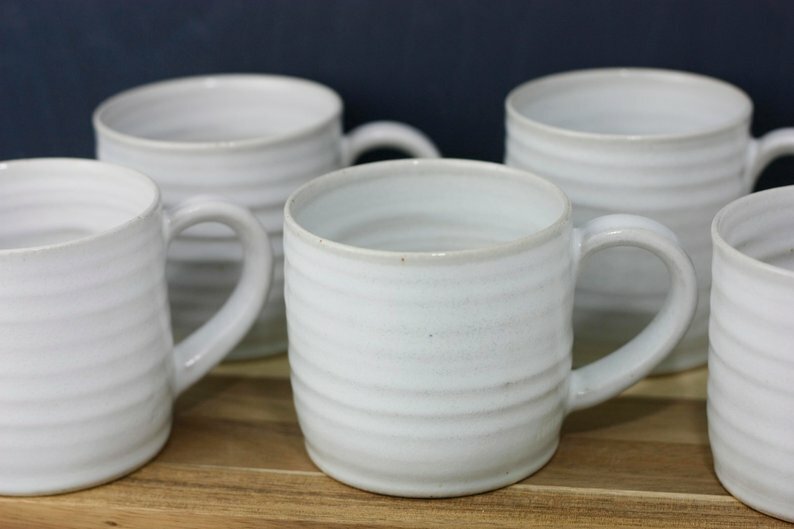 Featured here is Natalie’s white celadon glaze mug, hand thrown using white stoneware clay, and big enough for a decent cuppa. As they are handmade each mug is ever so slightly different which adds to the satisfaction of owning and using handmade products; you can see the craftmanship in every single one. I want a whole set of these! Teresa of Teresa Dunne Woven Textiles is local to me here in Boscastle! I have seen Teresa develop over a number of years and after trying out various textile arts she has definitely landed on her feet with her passion for weaving! 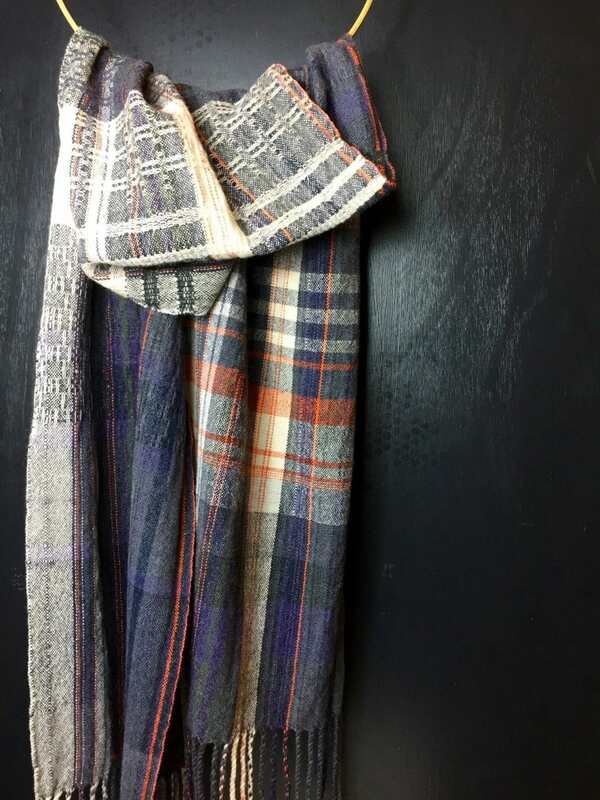 Teresa is a hand weaver and textile designer who creates colourful, hand woven cloth which is transformed into scarves and cushions, from her home on the rugged and often windswept coast of north Cornwall. Her studio overlooks the cliffs and sea, a constant reminder of the inspiration surrounding her. She finds the process from choosing the colours, working out the measurements, warping, dressing the loom, weaving and finishing very therapeutic. Shown here is the Botallack scarf with it’s mellow tones of coral, blue, cream and green. I also love her more vibrant colour combos, such as the Musk Mallow with its bright pinks and oranges, and the Cornish Rooftops scarf with its elegant mustard yellow and grey colour combo. I couldn’t really do a gift guide without including myself, could I?! My Rugged collection that was released back in October last year has met with a lot of interest and compliments. This year I’m building on that by adding many new one of a kind creations to the collection, which is inspired by the rugged coastline of the area where I live. The textures of the rocks and the sand, the colours of the sea, sky and surrounding landscape, they all play a part here. Gleaming gemstones are set into textured silver backdrops and the addition of patina makes for very characterful jewellery, elegant yet with an edge. For anyone who loves Cornwall and would like to take a piece of it home, this is a great way of doing just that. The fact that most items in this collection are one of a kind makes it even more special – you won’t see anyone else with the same piece of jewellery! 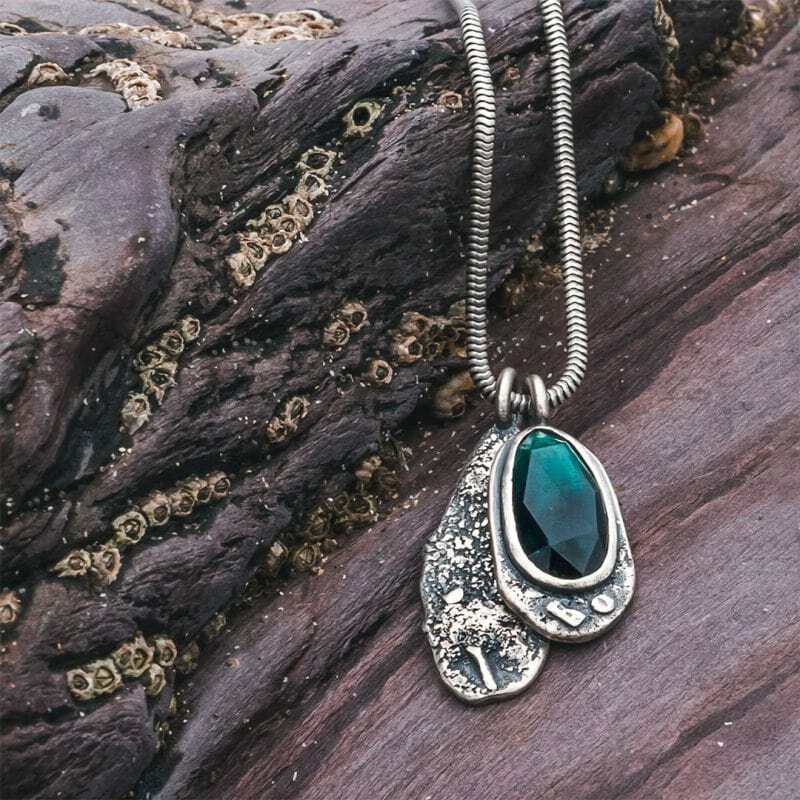 Shown here is a one off pendant with beautiful teal coloured Tourmaline, set in textured silver, in a cluster with a textured silver pendant. Similar pendants with various stones and colours are available on an ongoing basis, and if you fancy something in particular I make to order as well, just contact me. That’s it folks! Looking back as I write this, I realise that all of these products take inspiration from Cornwall, our natural world and the love of it; the urge to preserve it and leave it behind untouched for the next generation. Cornwall is a special place, for those who are lucky to live here, and for those many, many people who visit time and time again. For all of us, it’s lovely to be able to support the creative community here, and fill our homes with the beautiful products they make, take a piece of Cornwall back home as a constant reminder of this glorious county, or as some people call it: “country”! This entry was posted in About Me & Camali Design, Artists Reviews, Cornish, Products & Collections, Promotions, Style and tagged alisonbickdesigns, buy local, carinlindbergjewellery, gift, guide, handmade, mother's day, nataliebonneyceramics, particlepress, seaofgrassstudio, teresadunnetextile.